Here are my all Questions that I answered for fashionla bloggers interview and be sure to check out their site because they have got so many brands for both men and women and their stylish clothing can suit anyone and any style. Really Thank you to fashiola.co.uk and I'm blessed that they took my interview with other bloggers that I personally love there blogs. Well I am an idiot who always tries to find happiness everywhere..eh! Basically I am a law student, and of course, a dreamer too. Truth be told, I never thought or planned to be a blogger but it just happened and it seems like I am doing very well. Let's hope for the best. Where do you see your blog in ten years? Ten years from now, I want my blog to more popular than it is now to be honest, and I want it to shine and prosper. I also want to be a far more better in it. Do you have other hobbies besides blogging? No, I don't have any other hobbies to be frank. but I am a dreamer so you never know, what may be my next interest. Name your 5 ultimate fashion must haves? - blue skinny jeans for everyday use. - an effortless white t-shirt. - a perfect leather jacket, that would further brighten any look of mine. - a perfect body fitted blazer. - a beautiful skater skirt for a change. Name your favourite trend of the moment. Usually I never follow any trend but at this moment I am pretty much obsessed with denim on denim trend. Which of the items in your wardrobe has a special memory? I am a fun loving girl and I love to keep and share my best memories with all so I can't describe about any particular special item from my wardrobe because there are plenty. Name some of your favourite bloggers. 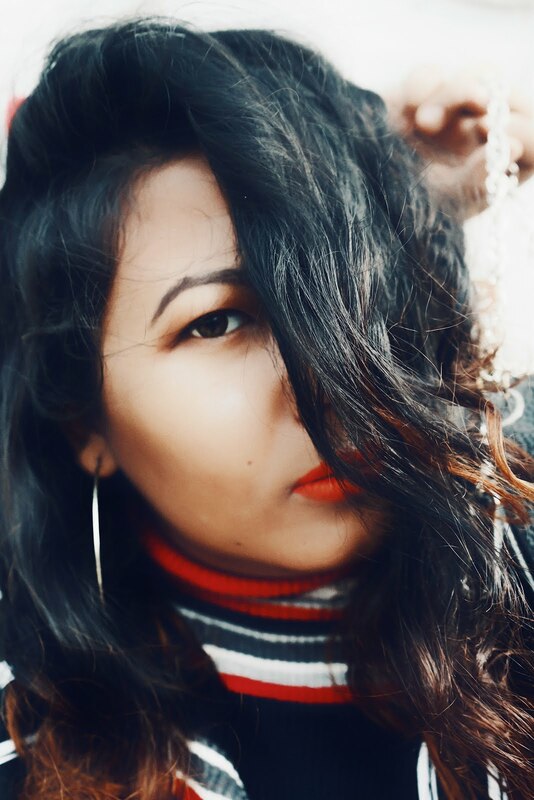 - NiLu Yuleena Thapa as Bighairloudmouth. Do you have a handy styling tip. A tip from my side would be "Be confident and love what you wear". Your favourite piece of clothing right now. Describe your favourite outfit that you have posted on your blog? My favourite outfit post from my blog is THE BLACK GAME as i am a black lover. What do you look for in a first outfit from someone else? The first thing that I observe in an individual's outfit and their colour combination, if the colours are complementing each other and how well they carry it off. What is your most expensive purchase ? I prefer intelligent shopping but as for now I am just a college student. I have to look after my expenditures with the pocket money I get so among all my purchases the costliest shopping I've done so far was my Asos duster coat. 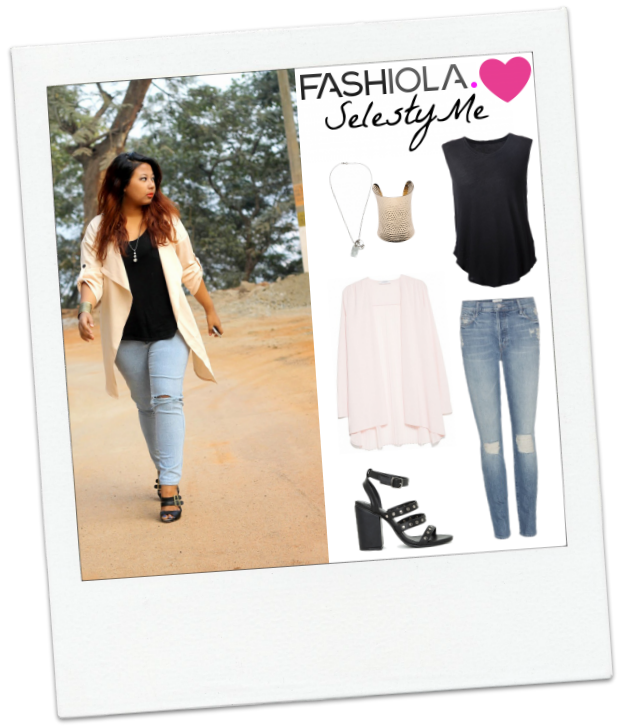 What do you like about Fashiola- the fashion finder. Fashiola- The Fashion Finder, just the name describes it all. I really like the way you all are promoting the other fellow bloggers. The dress collections are pretty awesome and some have definitely caught my eye. Which shops and brands could you not live without? Definitely River island and forever21.